Musée national des beaux-arts du Québec will pay tribute to a great pioneer of photojournalism, Lida Moser. The Hindsight entitled 1950: The Quebec of the photojournalist Lida Moser will be part of the exhibition Wide angle : a photographic season in Quebec and will take place from February 19 to May 10, 2015. Lida Moser died on August 12, 2014 at her home in Washington. She was 94 years old. Born in 1920 in New York, Lida Moser played an important role as a freelance photographer in several magazines, including the popular American magazine VOGUE. A photographer with a free spirit, she worked from 1936 to 1951 in the world of social and artistic photography. 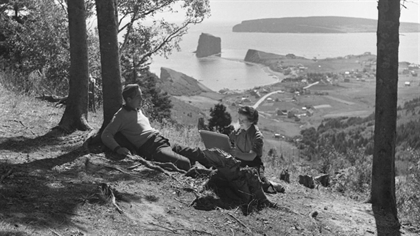 Initially commissioned to capture images of the Canadian landscape in the 1950s, she finally decided to make Quebec and its people his favored field. During her stay, the remarkable photographer traveled to Charlevoix, Isle-aux-Coudres and nearby Québec City, Île d'Orléans, Gaspésie, Montérégie and Montreal. In addition, she carried through her travels portraits of individuals who have marked Quebec's cultural landscape. Among the best known including sculptors Médard Bourgault and Louis Archambault, writers Alain Grandbois and Roger Lemelin, painters Alfred Pellan and Stanley Cosgrove, playwright Gratien Gélinas and conductor Wilfrid Pelletier. In addition to her portraits, much of her art was devoted to capturing snapshots of everyday life in a still traditional time, but on the point of marrying a turning point in Quebec society, La Révolution tranquille. Currently, the National Archives of Quebec holds 3594 images of Moser, proving her important contribution to the Quebec’s culture. The exhibition Wide angle : a photographic season in Quebec and will take place from February 19 to May 10, 2015 at Le Musée national des beaux-arts du Québec.